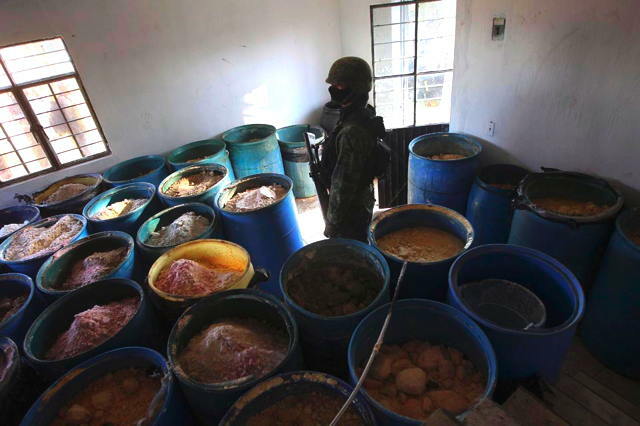 "Meth In Mexico: A soldier stood in a room full of barrels containing powder after the seizure of a small ranch in Tlajomulco de Zuniga, Mexico, Thursday. According to the Mexican army, 15 tons of pure methamphetamine were seized at the ranch." 15... Fifteen?... TONS? of meth were seized? A bit of calculation tells me that 1 short ton = 907,184 grams. Let's say that one gram of meth = one to four hits to a tweeker. *** That means that in one (1!) raid the Mexicans seized between 14 and 56 million hits of crank. Can that be real? Can that be true? Can that be what one Mexican meth operation is cranking out? That exceeds the mind's capacity to boggle. Is everybody in this country wired except me? Is it really that out of control? Doesn't seem possible. Can the government of Mexico be lying? Can our government be lying? How can I think such a thing? I must be sleeping. I need something to wake me up from this nightmare. ***How much meth did you use? Tweeker 1: "When I started, it was about 1/4 gram per day. I was still able to "sleep" (or at least pretend to), go to work, be an activist, and do a lot of mentally demanding things very well." Tweeker 2: "At my worst, I was using a teener a day. (1.75 grams) I was utterly incoherent by that point. The only time I felt any clarity was when I was getting that rush." Tweeker 3: I've done a gram in one day. I don't know if it is because it wasn't working like it should or if it was because I was just brain damaged. Almost makes one wonder if the hassle of buying a 24-pack of Sudafed is just security theater. Where are they getting their Sudafed from? Remember these tweekers are cranking it up 365 days a year. 56M/365 ~= 153,425, about the population of Palmdale, California (or about a third of Fresno, which seems more likely). Well, let's not forget that there will be a need for extra due to spillage, loss and sampling. Drug War numbers are often exaggerated, that is a given. Still, the real figures are probably staggering, and should tell us something very significant. With the amount of product made and sold, why aren't there even more addicts then actually exist? The answer is one of those inconvenient elephant-in-the-room facts: A majority of drug users, including a whole lot of those who use the hard, addictive stuff, are not addicts. Here's why this matters: "legalizing" drugs will not eliminate the illegal drug market because of the way that governments handle "reform" legislation. Drug use will be "legalized" for those with an addiction, leaving a majority fo users in the cold. A large illegal trade will continue to exist to accommodate those who don't "qualify" for government programs. That's not meant to be a show-stopper, but a sobering reality about the likely obstacles and uinintended consequences of "legalization." Maybe, just maybe, the feds will do like Mexico and allow for very small amounts for personal consumption for even non-addicts. Maybe. 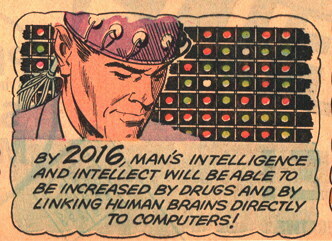 And maybe the government will also issue each of us our own personal flying pigs or pink unicorns. We will not recover from Generation Rx. Drugs are turning an entire generation into "zombies" with the concomitant expenses to the healthcare and prison system. I know, I'm living with one. Libertopians will discuss this endlessly from their fortified compounds and wonder what went wrong. Would drug legalization lead to drug manufacture? Is this an industry we really want to legitimize? There are some heavy consequences to legalizing drugs. Read "Methland: The Death and Life of a Small American Town" by Nick Reding for an up-close look at what's going on here in the Midwest. And to fully understand the insignificance of that bust. Let them use the crap. Then they can go die is bliss. If they commit a crime, the bliss comes from a cranial injection of minerals at or above the speed of sound. We need to stop the taxpayer funded rehab. Mexican gangs, however, are able to buy multiton shipments of pseudoephedrine and produce meth in batches of pounds at a time. This is why I am proud to show my driver's license in order to buy a box of decongestants that contains 1440 mg of pseudoephedrine HCl (/sarcasm alert). That's about a gram and a half for the metrically impaired. And no, I have no idea how much meth you can make with that because I'm to lazy to do the stoichiometry, but I suspect it is a drop in the bucket compared to 15 tons. The only redeeming part of the whole show-your-ID thing is the look of terror on the clerks face when I get up on the counter and start ranting about the evils of the Nanny State. I'm with SteveS on this. To StephenB, Mother Effingby and gcw: If things are as bad as you say they are, how, precisely, would making the stuff lawful again make matters worse? The stuff's unlawful to manufacture, possess, sell, and use, yet you can find it on any street corner in any large city.